Why not have a box of fresh local vegetables delivered to your door in Belstone? 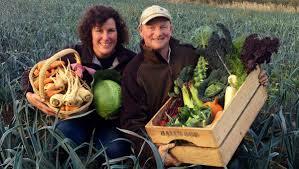 Richard and Ruth Kelsey, of Hallwood Fresh Veg, have been running a local delivery service for some years now. They provide local people and businesses with wholesome food, where the environment comes before profit. Although not certified organic they adopt organic growing methods where possible – many of their crops receive no sprays at all. Whatever the weather, whatever the time of year, their boxes provide locally grown vegetables at competitive prices, delivered to your door within 24 hours of harvesting. They even run an email ordering service. The 90 acre Hallwood Farm lies on gently sloping land on the outskirts of Petrockstowe. They are a traditional mixed farm with heritage breed pigs, Dorset lamb and Jersey x Ruby Red Devon Beef cattle. They also supply fresh meat, eggs, bread and all sorts of fruit. Take a look at their website www.hallwoodfarm.com or give them a ring 01837 811762 or 07831 186269 to discuss your requirements.